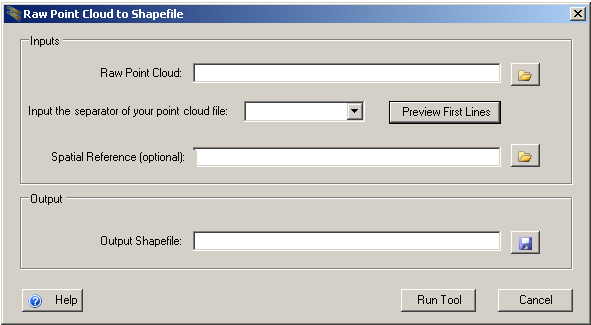 The Create Point Feature Class tool takes a raw xyz point cloud in a flat ascii file (e.g. *.csv, *.txt, *.xyz, *.pts) and converts it into a point shapefile for direct use in deriving a TIN and DEM. It also allows you to specify the spatial reference (coordinate system) of the point shapefile you will create, which is required to use the shapefile in a GCD project analyses (e.g. point density estimation). The tool is a precursor to Create DEM and/or TIN tool. contains x, y, z fields from the original surveyed points.